You could also let the child watch a few youtube videos of any young ukulele players. Ask the child if he or she has a favorite color or specific design that he/she likes. Make sure you do not buy an expensive ukulele for a beginner child. But do not get ukulele from the toy store either. A toy is not an instrument. You can also make that clear to your child so he or she would treat the instrument different than the toys. There’s a lot of ukulele for beginner level that is reasonably priced, from $25–$50. Check amazon.com for different pricing and models. Hand in the ukulele to the child and let him do whatever he/she wanted to do without breaking it. Once you see that a child is touching, tapping, plucking or anything to do with ukulele, he or she is ready to learn. Perhaps the desire towards ukulele has started. As long as the child does not bang or throw the ukulele like its a bouncing ball, let him or her have the curiosity with the instrument. Now that the child shows interest with the ukulele, let him or her continue exploring the instrument. Always remind the child that ukulele is an enjoyable instrument to play that creates a unique sound and a timeless instrument. With this in mind, you would be on the right track, there are many benefits your child will get from learning an instrument. 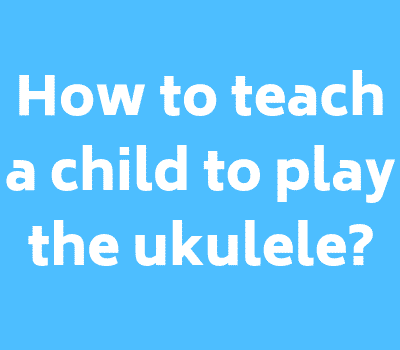 While a child curiously plucking or strumming the string, turning those tuning keys or lightly tapping the soundboard, you can explain to him/her the parts and functions of the ukulele. Perhaps show the child how to hold the ukulele properly. Keep watching, so that you can remind the child about the importance of properly holding the instrument without developing any bad habit. Then slowly tell him or her the names of each string in open position while plucking it. Before the child learns any chord, allow him or her to keep strumming gently as the open strings is a chord itself, a C6 or Am. Let your child enjoy the whole process of learning the instrument. After several times of strumming the open chord, the child is ready to learn the C major chord, very simple and easy to play. To play C major, have your child place the middle or ring finger on the third fret of the first string. Use all downstroke strumming. If the child discovers the upstroke strumming pattern, let him or her continue, as that is the natural process. Do not worry if the child does not repeat the same strumming pattern. Now the child is ready to learn his or her favorite song or a nursery rhyme. A great way to get your child started playing songs on the ukulele is simply to teach them how to play a nursery rhyme. There are hundreds you can choose from, and most likely your child will be familiar with quite a few of them. The majority of these nursery rhymes are played with either two or three chords. However, “Are You Sleeping?” is a song that will sound fine just with C Major. Later on after you introduce the next chord, which we’ll cover shortly, your child can add it to this song and others. The most common songs in almost any genre are almost sure to include G major. This chord, after C major, are the most popular chords. So this is a great starting point for your child. place the middle finger on the second fret of the first string. With these fingers in place and a nice gentle strum, you will hear one of the most popular chords ever. As I mentioned earlier the majority of nursery rhymes are played with 2-3 chords. C major and G major are the ones your child should learn for sure. Next, let’s take a look at a song that your kid can play with these two chords we’ve gone over. This is another easily recognizable nursery rhyme that your little one most likely enjoys already. For the most part, the song is mostly playing the C major chord. You can switch to G major when you sing the word “life” in “life is but a dream”, then switching back to C major to end the song. Now the last chord you want to teach your child at this stage is F major. Together with C and G, these three make the top most popular chords for the vast majority of songs. After learning these three chords and getting really comfortable playing and switching between them, learning easy songs becomes a breeze. In fact, the next song is super popular right now and I’m sure you will get a kick out of it yourself! It seems like every parent I talk to knows the song like the back of their hands. Well at this point it might be a good idea to add teach them new songs they already enjoy listening to. Take a note of the next 5 songs you would like to teach and double check that it has these chords in it. If not, no biggie, learning new chords after these will be a new challenge that will help your kid learn and develop. And it’s a wrap, folks! If you had the patience to follow these steps with your little darling, we want to be the first to congratulate you! Good job! A few new songs, a few new chords, and perhaps a couple of different strumming patterns to make things interesting and your child will be on the way to performing at American Idol.